X-Press Magazine – Entertainment in Perth – JURASSIC WORLD: FALLEN KINGDOM gets 5.5/10 Dino-might? JURASSIC WORLD: FALLEN KINGDOM gets 5.5/10 Dino-might? The world’s worst conceived theme park continues to prove what a disaster it is, as the dormant volcano at the heart of Isla Nublar suddenly springs into activity. With a large scale eruption imminent, the now feral population of dinosaurs are threatened with extinction for a second time. Former Jurassic World manager now turned dinosaur protection advocate, Claire Dearing (Dallas Bryce Howard), is recruited by a partner of Ian Hammond to return to Isla Nublar and save a number of the creatures. Of special interest is the capture of the last velociraptor, Blue, for which they would need her trainer Owen Grady (Chris Pratt). However, with a mysterious mercenary group having already retrieved the DNA of the Indominous Rex (shown in a spectacular opening sequence), it is clear that the island might harbour more dangers than just the rabid dinosaurs and lava spewing volcano. 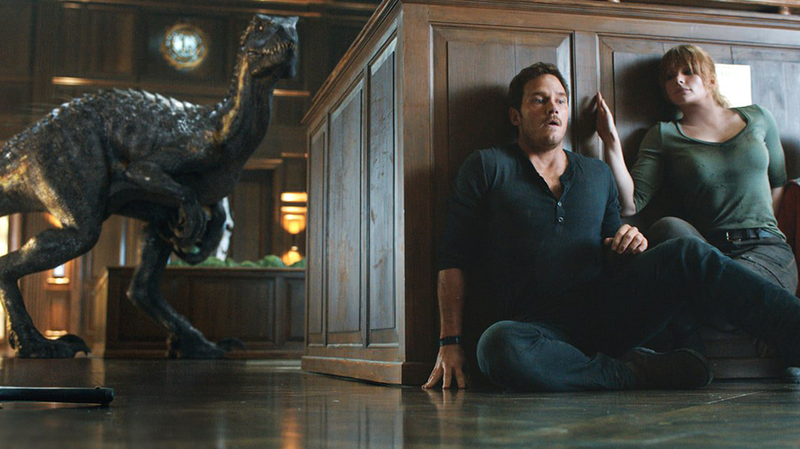 Despite its obvious attempts to re-capture the magic and wonder of the original Jurassic Park, Jurassic World: Fallen Kingdom is better as a set-up for the conclusion of the Jurassic World trilogy than it is as a sequel in its own right. Taken in isolation it is a perfunctory if somewhat underwhelming film, with a few magnificent sequences peppered throughout. However, by the time those final credits roll you are excited to find out what happens next. Really it comes down to the script. The story is just not robust enough to stand alone. Sure it ties itself to the continuity of the Jurassic World series, acting as a bridge between the two parts, but it rarely manages to stand on its own feet. Occasionally we can see flashes of brilliance, like the shadow of some long lost behemoth glimpsed through the smoke, but mainly it is just wrote action sequence after wrote action sequence. The whole film feels like an obvious imitation of Spielberg rather than a genuine expression of director J.A. Bayona’s talent. Chris Pratt and Bryce Dallas Howard return, making a great combo of actors for this sort of action adventure franchise. Pratt, especially, seems in his element, revelling in the role. However, as always, the true stars of this franchise (besides Jeff Goldblum) is the combination of computer generated and practical effects used to create the dinosaurs. Here they are again put to good use, even if the final CGI fight gets a little ropey in terms of physics and believability. How crucial is that in a film where advances in genetic science has brought dinosaurs back to life? Well, if an audience is buying that premise, they really don’t need any further strain on their credulity. Ultimately, despite some charismatic performances, at just over two hours Jurassic World: Fallen Kingdom feels more like a sluggish sauropod rather than the lightning quick velociraptor it really should be.